Much of this will depend on the computer that you are using (Windows PC vs Apple) and what audio software it comes with, and also whether you are prepared to buy any new recording / audio editing software. Many professionals refer to this software as the DAW or 'Digital Audio Workstation'. 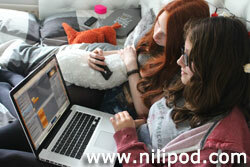 We record the NiliPOD on an Apple MacBook laptop computer, using GarageBand, which is just an awesome piece of software and so easy to use. It is quite simple to set yourself up with multiple tracks, setting the volumes at different levels. GarageBand comes with literally hundreds of free background tunes and sound effects, which are available for you to take full advantage of. These can be especially useful if you are planning to make your own jingles. Adding a touch of echo and reverb always seems to go down well, and if you are feeling creative, you can make use of the keyboard instrument feature to create your own unique music and sounds. You can also download various recording apps and even use the audio function on iMovie. Other popular choices include Adobe Audition, Audacity (open source software), Audio Hijack, Call Recorder for Skype, iPodcast Producer, Logic Pro X, MusicMatch Jukebox, Sony Movie Studio Platinum, Sound Recorder (a Windows basic) and Total Recorder. Software prices can vary greatly, and it is important that you are happy to edit your podcast with ease, rather than this becoming something of a nuisance. Don't worry though, there are loads of podcast recording YouTube tutorials should you need them. Bear in mind that software changes all the time, so try to keep on top of any updates and upgrades, which may well prove to be super useful. Podcasts: What software will I use to record and edit the broadcasts?